Less than 90 miles from Chicago, IL and Milwaukee, WI, you’ll find the city of Rockford, IL. Rockford is a unique combination of city and farmlands and is quickly becoming a bustling tourist destination. From interactive museums to fun outdoor activities, Rockford has a ton to do, even when the weather isn’t the best. Here’s a TMOM-tested list of the top things to do in Rockford IL in spring. I lived in the Chicago area for a few years as a kid and yet we never ventured to Rockford. 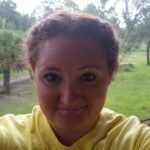 So, when given the opportunity as an adult, I jumped on it! I followed the weather closely leading up to my trip, knowing that it could be snowing, raining or sunny. Funny enough, it was snowing the morning of my flight, but by the time I arrived in the early afternoon the snow was gone. Luckily, my itinerary was built with the ever-changing weather in mind. 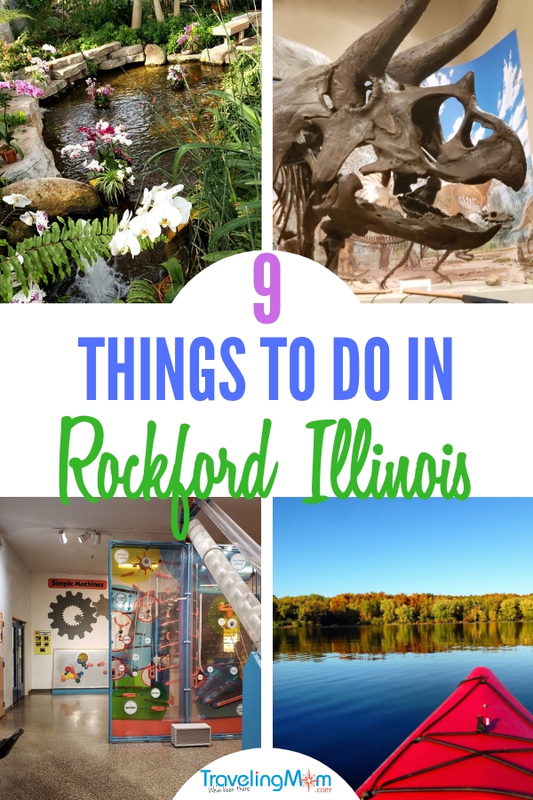 It gave me the chance to experience a little bit of everything Rockford has to offer as a family vacation destination or even as a quick weekend getaway for those in the Midwest. I wouldn’t consider myself an art connoisseur by any means. And honestly, my kids would groan if I suggested visiting an art museum. But this isn’t the “stuffy traditional” art museum running through their minds. The Rockford Art Museum is urban, modern and the perfect place to introduce teens and tweens to art. I was there during two extraordinary exhibits – Cheryl Pope’s Not Without a Fight and the Young Artist Show. And I wish I could take every tween and teen I know to these two exhibits. The Young Artist Show featured pieces by local teens chosen from high schools within 50 miles of the museum. Because of Rockford’s unique location, this includes schools from outside the Illinois state lines. In its 78th year, the Young Artist Show had close to a thousand entries, but after judging and deliberation only 90 students were chosen. In mid-April, the museum will change out the art and feature pieces from the local k-8 schools. There isn’t a better way to get kids excited about art than letting them show off their talents! And these kids are absolutely incredible. Now, Cheryl Pope’s Without a Fight is a must see for everyone. Chicago artist and golden glove boxer, Cheryl Pope is as unique as her art. Incredibly she has found a way to open our eyes to what high school students everywhere are thinking, feeling and too afraid to say to their parents and peers. 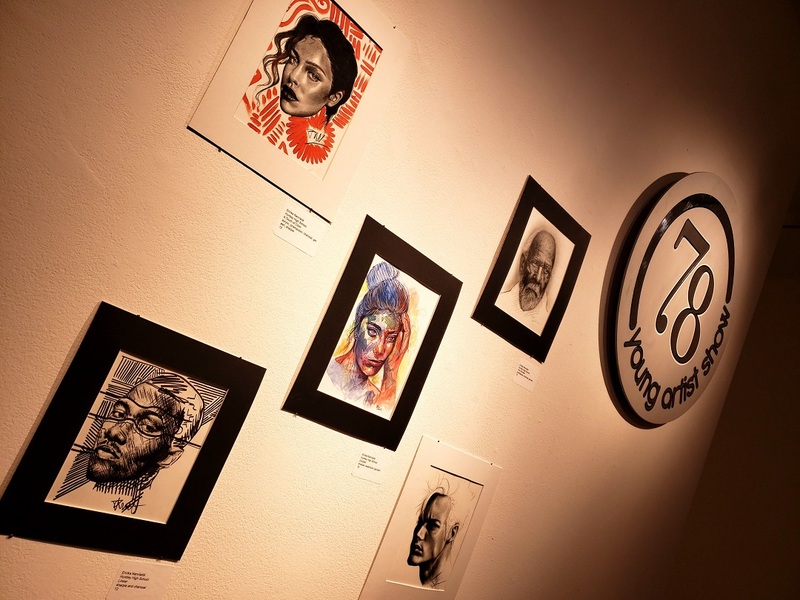 Featuring spoken word and mixed media this is an emotionally charged exhibit is a must see before it disappears Memorial Day, May 27, 2019. Located in the Rockford Museum Park in the heart of downtown Rockford, the Discovery Center Museum is a gem. Mostly, indoor, multiple levels and full of hands-on learning fun, the Discovery Center Museum is the perfect rainy day destination! While focusing on ages 12 and under, there is more than enough to get the teens involved in. I knew as soon as I walked in I was itching to get my hands on some of the activities. There are places for imagination play, such as a hospital, and body shop. The kids can even host their own news show with a green screen and everything! Learn how electricity flows, how those giant windmills produce power and how much electricity it takes to power different household objects. I have to admit, I was shocked at how much power it takes to make my morning smoothies. And there is a special tot spot just for 6 years and younger. It features a giant playhouse for role-playing, a crane that lets the kids move objects from one spot to another and, in a quiet section, a baby spot for the toddlers and infants. When the weather is nice, there is a two-story outdoor play structure that is open to all Discovery Center visitors. The Rock River Discovery Park is massive and has a healthy choice maze, water play zone and a secret garden. The Discovery Center Museum from time to time has special traveling exhibits and until May 12, 2019, guests of the museum can interact with Thomas the Train! Perfect for those young ones. 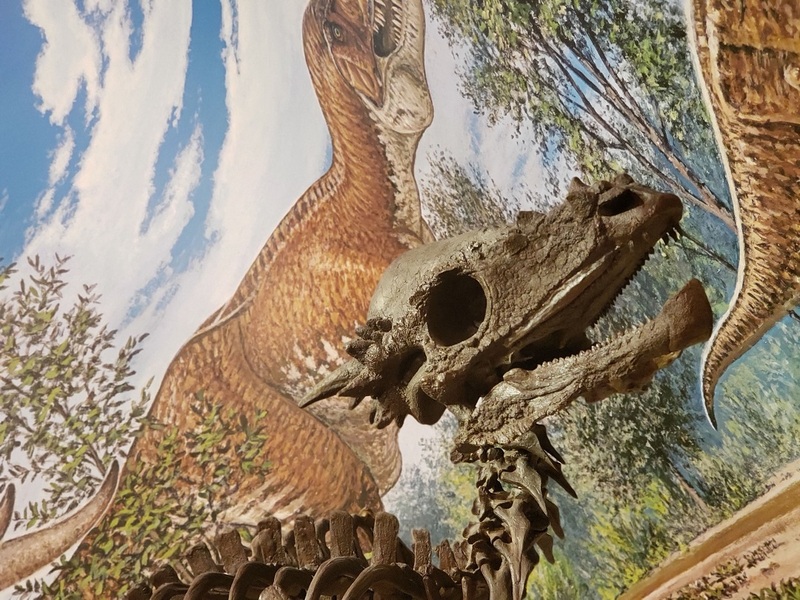 Take the underground tunnel from the Rockford Museum Park to the Burpee Museum of Natural History to start your adventure off right! Plus, there is more parking at Museum Park than at the Burpee Museum. This one is for all ages and a must-do for any dinosaur lover and rock collector, which sums up my whole family. My son could spend HOURS looking at rocks. Why? I have no clue, but rocks are like magnets for tween boys. The Burpee Museum is filled with interesting and magnetic exhibits, like the unusual rocks in the GeoScience exhibit. But, try not to let them get caught up by the rocks. There’s more to explore. Jane: Diary of a Dinosaur is an in-depth story of a juvenile T-Rex that was captivating and educational. I normally am one that rushes through exhibits because I am a fast reader, but I took my time with Jane. Her story was fascinating and one that I know my kids would love to follow. Other exhibits at the Burpee Museum of Natural History include The First People a native American exhibit that features a full-size wigwam and tipi along with a canoe that kids can explore and climb in. Windows to Wilderness that gives visitors a looks at the wildlife in the Rock River Valley and offers an interactive learning experience. But I have to admit my favorite spot in the whole museum was The Jay and Barbra Brost PaleoLab. I spend quite a bit of time intently watching as they carefully unearthed fossils and preserved them to be displayed at the Burpee Museum of Natural History. The Laurent House Museum is the former home of disabled World War II veteran, Kenneth Laurent and his wife, Phyllis. It is also the only home designed specifically for a person with a physical disability by the famous Frank Lloyd Wright. The home was designed in 1946 and built in 1951-1952. Originally 1400 sq. ft., the incredible “Usonian-hemicycle” home was uniquely designed around Kenneth, who was wheelchair-bound. Ahead of the times, Frank Lloyd Wright wanted the home to never make Kenneth feel like he didn’t belong in that house. Low ceilings in the house made it so he’d wouldn’t feel small, the furniture was built to bring others to his level and Mr. Wright’s open floor plan made the house easy to maneuver in a wheelchair. The Laurents added on to the small home when they adopted two children and again, Mr. Wright was asked to design the addition. He died before the plans were complete, but his apprentice, Mr. Howe, finished them. And in my opinion, you couldn’t tell the difference between the addition and the original home. This was the first Frank Lloyd Wright building I visited. And while I appreciate unique buildings, I don’t normally seek them out. That changed on the day I visited the Laurent House Museum. I was fascinated by the extraordinary personal touches Mr. Wright did on the Laurent House. My favorite was how he found a way for Mr. Laurent to take care of the small pond directly outside the family area. Featuring an interactive museum indoors and a 148-acre historical village,the Midway Village Museum is a great indoor and outdoor activity. 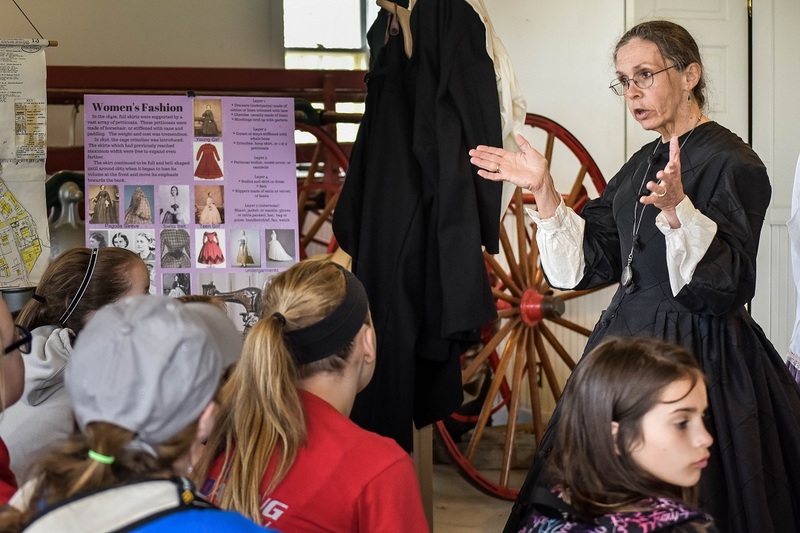 The Midway Village is the place to learn about Rockford history. Discover the history behind the Sock Monkey and learn about the Rockford Peaches, who inspired the film, A League of Their Own. The history museum has a brand new exhibit, Many Faces, One Community, that uses hands-on learning to teach children about the immigration to Rockford and how the community was built. Kids can try a flight simulator in the Flight Gallery and learn about aviators from the Rockford area, like Bessica Raiche who was the first woman to do a solo flight. As a former homeschool mom, as I was walking through the museum, all I could think about were the incredible learning opportunities available. And ones that my kids would enjoy it so much they’d forget it was educational! May through August, the outdoor village comes to life and becomes a bustling Victorian-era town. 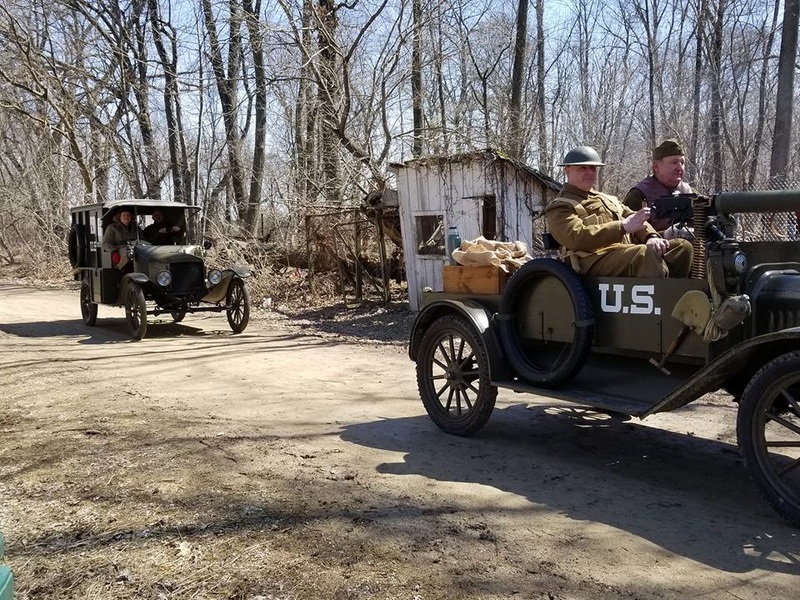 The reenactors and interpreters are there to teach and educate about their way of life in the 1900s. The 10 heritage gardens are bursting with Victorian horticulture just waiting to be explored. And special events throughout the summer give visitors the opportunity to see the Midway Village Museum in a new way. The biggest event at the Midway Village Museum is the World War II days that take place during September. As a huge fan of the Victorian era, I can’t wait to go back during the summer months just to visit The Village. This Floridian needed a little tropical paradise after a couple of days of chilly temps! And the Nicholas Conservatory and Gardens was just what the doctor ordered. I can see why the locals flock to this special place during the winter months. The bubbling streams, cozy little corners and quiet tranquility is a much-needed escape from busy life. I wish I had a book with me because I would have spent hours there just reading in the botanic gardens. During my visit, they had just finished the “In Full Bloom” exhibit, but the brightly colored orchids were still prominently in the garden. And absolutely gorgeous. It was a photographer’s dream. I spent much of my time pretending to be an amateur photographer snapping pictures of the stunning orchids. They were quietly getting ready for their next event, Simply Spring: The Butterfly Exhibit, open now through June 2, 2019. Visitors will be dazzled by the stunning beauty of the butterflies. But tickets sell out quickly, so get there early! 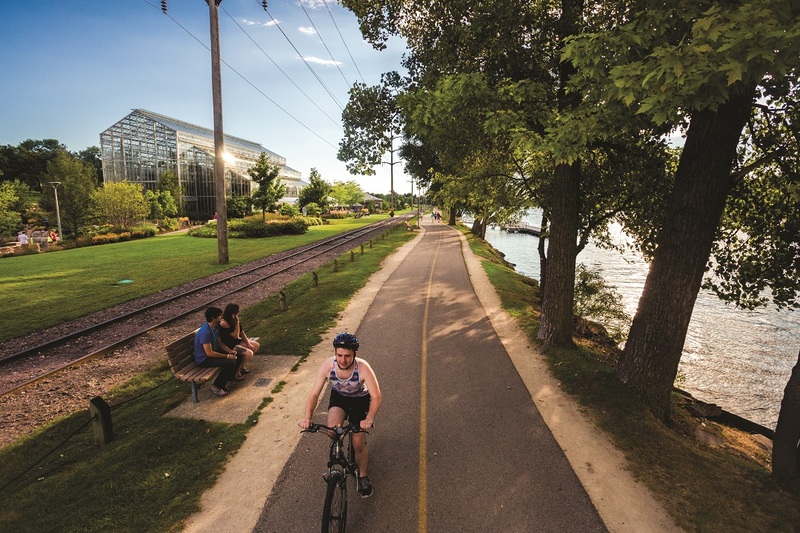 Even though it was chilly, the sun was shining and the Sinnissippi Bike Path was filled with walkers and bike riders enjoying the change in weather. The path, also known as the Rock River Rec path, offers a wide-open trail next to the river for those looking to take an outdoor stroll. The Sinnissippi Gardens are along the path and during the warmer months offer exquisite views and brightly colored flowers. Adjacent to the Sinnissippi Bike Path is the Sinnissippi Park, another great place to explore and let the kids run off some pent up energy! Rock Cut State Park is for my outdoorsy adventure travelers. Okay, so my kids probably don’t fit that description, but there is so much to do at the park that everyone would be entertained. Rock Cut State Park is open year round, giving guests the chance to get outdoors no matter the weather. During the winter months, visitors can go ice fishing, ice skating or even cross country skiing. Once the weather warms up the park is filled with visitors hiking, boating, swimming and more. There is even geocaching, which my tween and teen would love! The Rock Cut State Park has a campground with 270 campsites including spaces for RV camping, a cabin, and equestrian camping opportunities. Unfortunately, I wasn’t able to explore much of Rock Cut State Park due to some flooding. I hope to make it back soon because I’d love to try my hand at ice fishing! Due to the timing of my visit, I wasn’t able to experience all of the Anderson Japanese Gardens. I did get to have breakfast overlooking the gardens at Fresco at the Gardens and chat with David Anderson, the son of the visionary behind the botanic gardens. What started off as a backyard project in 1978 has grown to be one of the top five Asian-inspired gardens in the world! 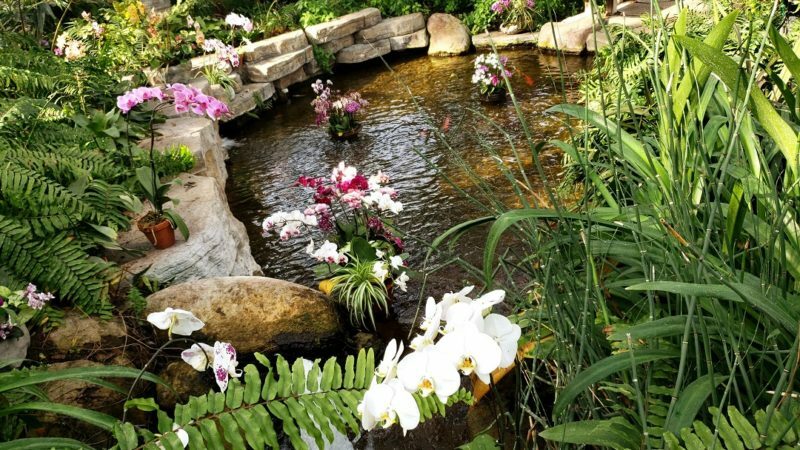 The Anderson Japanese Gardens is a non-profit that focuses on building community relations and getting people to disconnect from the outside world. Escape to a world of tranquil peace and let go of the stresses of everyday life. 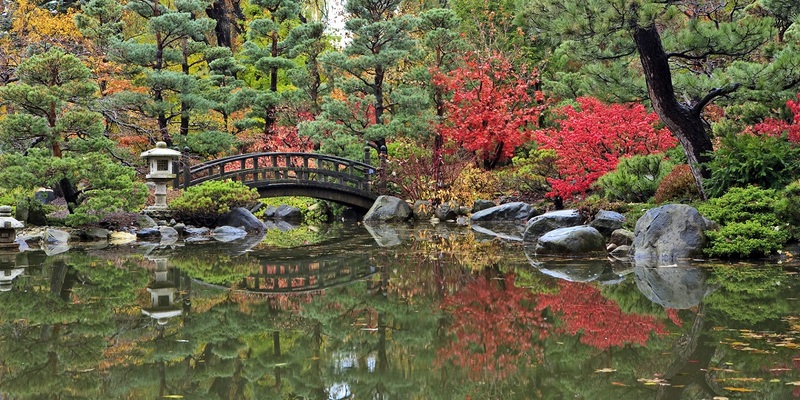 To accomplish these goals, Anderson Japanese Gardens host a variety of community events, including Tuesday Night in the Gardens (featuring live music) and Bat Nights in the Garden. They open the gardens to groups such as hospice patients, youths struggling with addiction and more. Kids can partake in specially designed enrichment programs. Open seasonally, May through the end of October (maybe longer, if David gets his way). Visit both the Anderson Japanese Gardens and the Laurent House Museum with a special tour that takes place Wednesdays and Fridays. Learn more on the Anderson Japanese Gardens website. Sometimes when traveling, the weather doesn’t cooperate, so it’s always good to have a variety of indoor and outdoor destinations in mind! I learned that quickly with my Rockford trip and boy, am I glad the weather gave me a push indoors at times.